Rabbits can wreak havoc with landscapes. Fortunately, there are many flowering plants -- annuals, perennials and shrubs -- that rabbits generally avoid. Some have strongly scented leaves or flowers, while others contain distasteful or poisonous substances. Choosing wisely from among the rabbit-resistant species will save money and anguish once the growing season starts. 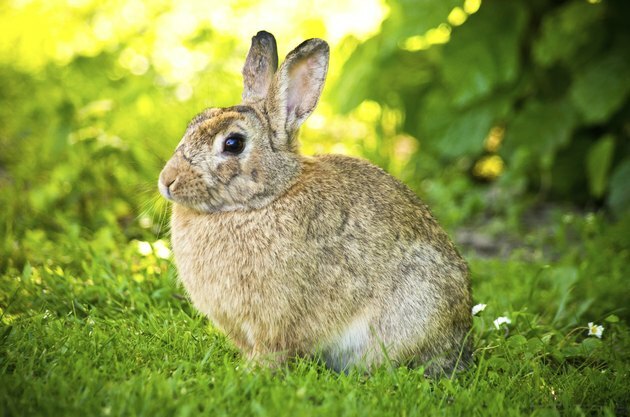 No "critter-proof" designation is infallible because different rabbits like or dislike different plants. A plant that is rabbit-resistant in one location may tempt rabbits in another. In times of scarcity, a truly hungry rabbit may also eat just about anything. A wild rabbit sitting on the lawn. A close-up of pink and purple common zinnias. Common zinnias (Zinnia elegans) and lower-growing creeping zinnia (Zinnia angustifolia) are among the plants that rabbits avoid. Both are sun lovers and flower in every color except true blue from summer through frost. Snapdragons (Antirrhinum majus), hardy in U.S. Department of Agriculture plant hardiness zones 7 through 10 but generally grown as annuals, are another species that rabbits avoid. 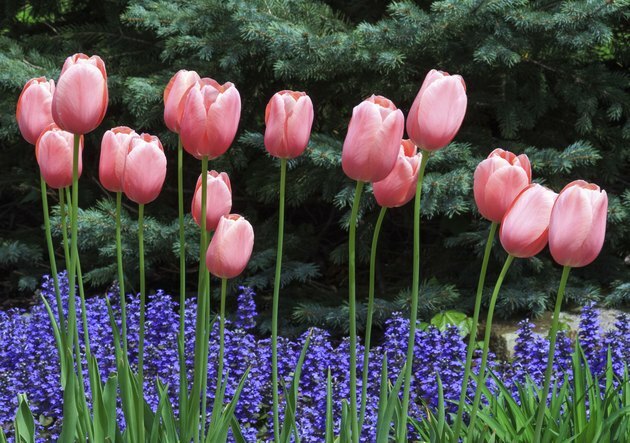 Sun-loving and prolific, they come in sizes ranging from 1 to 3 feet tall, bearing upright flower stalks. 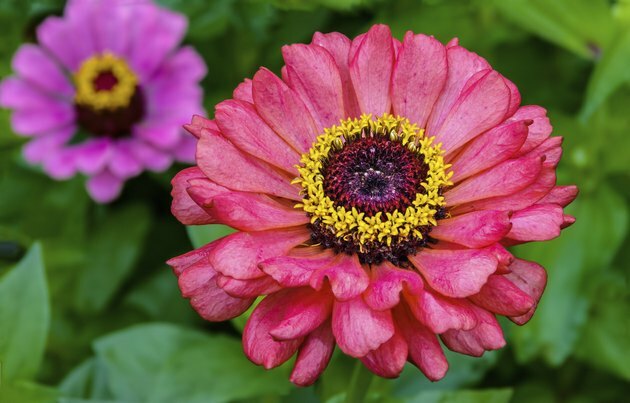 Both zinnias and snapdragons will self-seed under the right conditions. Purple foxgloves growing in a flowerbed. 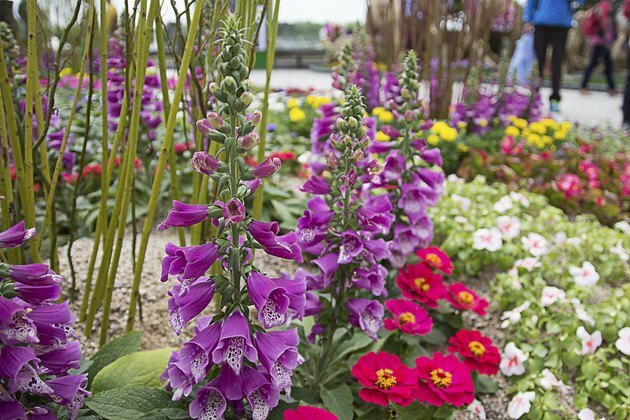 In late spring, shade-loving foxglove (Digitalis purpurea), hardy in USDA zones 4 through 8, bears tall spikes of tubular flowers that rabbits disdain. Perennial anise hyssop or hummingbird mint varieties, like "Just Peachy" (Agastache auriantica "Just Peachy"), hardy in USDA zones 6 through 10, thrive in sunny, dry spots. While hummingbird mint attracts hummingbirds and butterflies, its fragrant leaves repel rabbits. Another rabbit-resistant sun lover is Shasta daisy (Leucanthemum x superbum), hardy in USDA zones 5 through 8. Shastas bloom in early summer to midsummer, bearing large, white daisies with yellow centers. 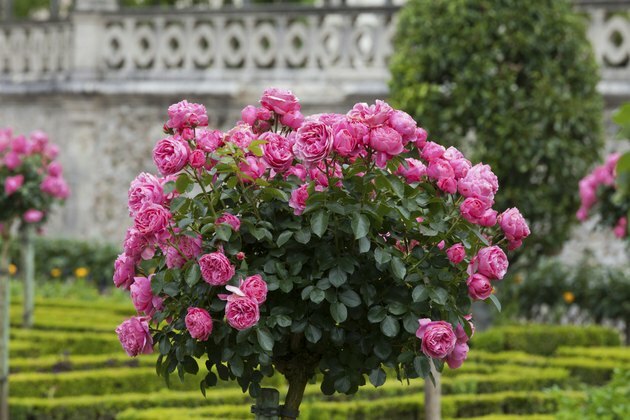 A thorny rosebush with beautiful pink blooms in an ornamental garden. Flowering shrubs add much to the ornamental garden, and some repel rabbits. Slender deutzia (Deutzia gracilis) is a sun- or light-shade-loving deciduous shrub that bears clusters of small, fragrant, bell-shaped flowers in late spring. It is hardy in USDA zones 5 through 8. Thorny roses also deter rabbits, and the Japanese rose (Rosa rugosa), hardy in USDA zones 2 through 9, features exceptionally bristly stems, in addition to fragrant single roses in shades of white, pink or red and somewhat wrinkled or rugose leaves. Like most roses, rugosas flourish best in sunny locations with well-drained soil. Violet-blue bugleweed growing beneath a row of pink tulips. Flowering ground covers add color to the garden and, if carefully chosen, repel rabbits. Bugleweed or carpet bugle (Ajuga reptans) produces 6- to 8-inch blue flower spikes in spring, accompanied by scalloped leaves. Hardy in USDA zones 3 through 10, bugleweed adapts to a variety of light situations, including deep shade. Spotted dead nettle (Lamium maculatum), hardy in USDA zones 4 through 8, is also about 6 inches tall and bears spikes of pink or white flowers, sometimes accented by variegated or multicolored leaves. Both bugleweed and spotted dead nettle have been reported as invasive in some locations. For more information on deterring rabbits, visit .